Blackpool during the dreary days of January, like many Victorian seaside resorts, loses much of its sparkle and joviality. Even its buildings droop beneath wintry grey skies. But, for some of its Masonic residents, Provincial appointments and promotions bring a happy respite from this otherwise gloomy month. When letters from Provincial Grand Lodge or Provincial Grand Chapter drop through the letter box, they bring with them a feeling of sunshine and springtime. Keith Beardmore (left) congratulates Martyn Jones on becoming the new master. One Mason receiving such correspondence was particularly buoyant and filled with the inclinations of spring as he wended his way to the Masonic Hall in Blackpool. He had been exuberant as he prepared for his lodge meeting that afternoon. The soothing shave was executed with joy and he wallowed in a reviving shower. His shirt was crisp and gleaming. His trousers sported a razor-sharp crease. He had a lively spring in his heels, for it was the day on which he was to be installed into the chair of King Solomon in his lodge. 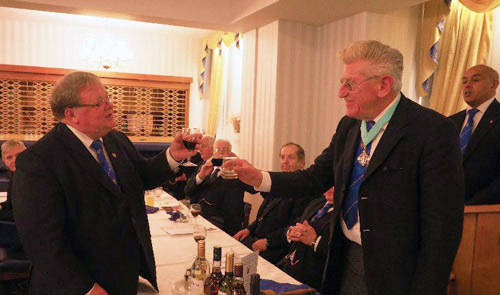 The honour of being installed into the chair of Blackpool Temperance Lodge No 5303, in itself, would have been sufficient reason for Martyn Jones to rejoice but he was also celebrating his recent Provincial Grand Lodge promotion to Past Provincial Junior Grand Warden, plus a Provincial Grand Chapter appointment of acting Provincial Grand Sojourner. It was a triple celebration for him and he was quite fairly in a bonhomous mood. One might surmise that Martyn’s day could not get better but nothing could have been remoter from the truth. The quality of the installation ceremony, the geniality of the gathering and the camaraderie of the festive banquet made it a very special and memorable day. Opening the meeting with his usual cheery self, master of the lodge Sheldon Rawstrone conducted the opening and general business with the skill and clarity becoming a Mason of such experience. Sheldon is a man with a degree of savoir faire; a man of style and presence and his panache in conducting the affairs of the lodge was distinctly marked by his polished performance. 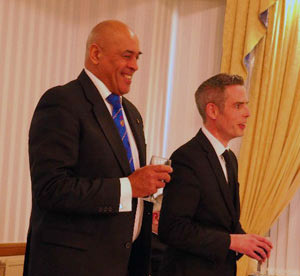 Prior to the announcement of the installation ceremony proper, director of ceremonies Martin Linton oozed out of the lodge room, and a few moments later oozed in again to declare the presence of Keith Beardmore, representing the Provincial Grand Master. 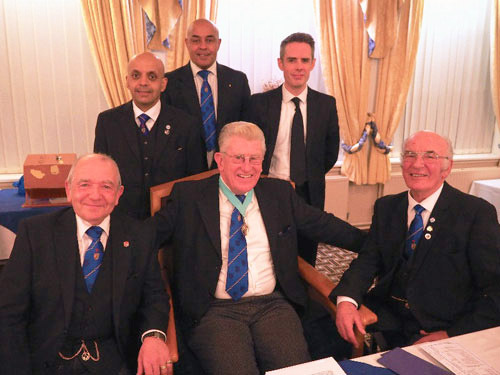 Amongst the plethora of eminent Masons in Keith’s entourage were Past Assistant Provincial Grand Master of East Lancashire Norman Cope, the Chairman of Blackpool Group John Turpin and grand officer Geoffrey Pritchard, along with Provincial dignitaries of the standing of South Fylde Group Vice Chairman John-Robbie Porter, Blackpool Group Secretary Steve Jelly, Past Provincial Senior Grand Wardens John Lee and Bob McGown and acting Provincial grand officers John Guest, Jim Finnegan and John Rimmer. 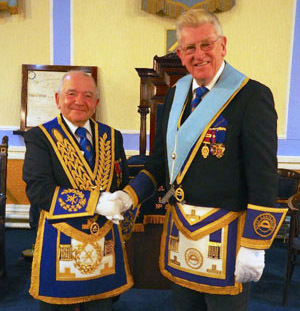 Installing master Sheldon Rawstrone (left) hands over the reins to Martyn Jones. Having given a sincerely warm welcome to Keith Beardmore and the remainder of the luminaries, and following the customary salutations that are executed on such occasions, Sheldon commenced the installation ceremony in the spectacular fashion that he is so renowned for. Requesting Martin Haines to occupy the office of installing senior warden, John Bellhouse to undertake the role of installing junior warden and John Haines to be installing inner guard, it was time for director of ceremonies Martin Linton to present Martyn to Sheldon, who proceeded to place him in the chair of King Solomon in a truly sincere manner and with worthy and genuine reverence. On being deposited in the chair, Martyn was obviously very much on velvet from the start. A delightful spirit of happiness prevailed and he was merrily drinking in the atmosphere. The traditional presentations of working tools in each degree were performed in faultless fashion by Umesh Dholakia who delivered both the third degree and first degree tools whilst David Edwards presented the extended version of the second degree implements. Despite the challenge that loomed in presenting the working tools of a master Mason at short notice, Umesh’s mood was serene – a dashed ordeal to stand up and perform in front of a whole collection of Masons when having had only a few days’ notice. A lesser person would have stood there in dumb despair but Umesh is made of sterner tissue and addressed the difficulty with grit and passion and carried the thing through with bravura. Martyn Jones (centre) surrounded by, from left to right, are; Keith Beardmore, Umesh Dholakia, Martin Linton, David Edwards and Sheldon Rawstrone. Blackpool Temperance Lodge is a very small lodge with a huge heart and well-blessed with master ritualists. 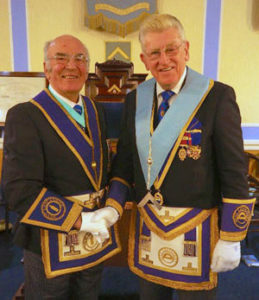 Martin Linton demonstrated his credentials with a faultless presentation of the Hall Stone Jewel, and again later in his perfect rendition of the address to the newly-installed master. Martin’s reputation as a director of ceremonies and ritualist of quality is acknowledged over a wide area, including the Province of East Lancashire from where a number of visitors attended the installation ceremony. The high standard was maintained throughout the investiture of lodge officers with spectacular performances from Martin Haines of Fraternal Lodge No 4531 who gave the address to the senior warden and Jim Finnegan of Mereside Lodge No 6360 who delivered an inspired address to the stewards. There was only the address to the brethren of the lodge to complete the ceremony, a piece traditionally executed by the principal guest. Martin Linton led Keith to the allotted spot like a stately galleon under sail and, with elegance and vim, Keith gave a sincere address much admired by the onlookers. The ceremony had been first class and, on its conclusion, Keith rose to convey the greetings of the Provincial Grand Master Tony Harrison. He was lavish in his praise of each of the brethren who had taken part in the procedures but, while he had spoken with generous warmth of Martin Linton, Umesh Dholokia, David Edwards and all who had taken part, for Keith is always a man to give credit where credit is due, he made it quite clear that his greatest admiration was for the excellence of Sheldon Rawstrone’s performance. Martin Linton (left) and David Edwards enjoy the company of the visitors. Keith’s admiration was further amplified when Sheldon presented him with charitable disbursements amounting to over £3,500. “A phenomenal sum for such a small lodge to achieve”, as Keith remarked as he read the figures out. “It speaks volumes for the generosity of the brethren”, he added as he disclosed the sums of £2,000 to the Masonic Charitable Foundation 2021 Festival, an additional £600 plus £125 Gift Aid to the MCF 2021 Festival, £250 to the West Lancashire Freemasons’ Charity, £270 to Second Skin, £250 to DEBRA and £100 to the Blackpool Masonic Club Building Fund. At the denouement of the formal proceedings, the congregation sojourned in high spirits to the bar for a few stimulants before progressing to the festive banquet and throwing themselves into the foodstuffs with abandon. Conversations were lively and vocal. There was a hefty spirit of fun and cheeriness as they delved into their soups and supreme de volaille and pommes de terre rôties. When the lemon cheesecake arrived however, there was a lull in the conversation because, no doubt, lemon cheesecake is a thing to give your undivided attention to, if you want to do it justice. The revellers were nevertheless, soon back on track and liveliness prevailed throughout the remainder of the meal and into the speeches, all of which were constructed to ensure utmost fun and enjoyment while still apprising their audience of all the relevant and serious issues. Keith, in a chummy and cheery mood reiterated his approbations for Sheldon’s and the other’s performances in the ceremony and wished Martyn a happy and healthy year in the chair. His response to the toast to the grand officers was just what the proletariat wished for. It was sincere and informative. It was relaxed, entertaining and humorous. Harry Waggett (left) toasting Martyn Jones. Blackpool Temperance Lodge, at the time of its consecration in 1931, strictly adhered to the principles of its title. Alcohol was not permitted at a festive board and behaviour was sombre, serene and reverent – not what might be considered a haven for carousers. But, whilst appropriate serenity is still observed, the modern Temperance Lodge knows how to have fun and the members have developed a particular expertise in revelling. Whilst the original founders of the lodge may have frowned at the relaxation of some of the rules, one can be certain that they would have applauded the friendliness and camaraderie evident at this installation. Rounding off the celebrations with the master’s song, Harry Waggett, a favourite amongst the party-goers, provided a delightful rendition of the traditional song, expertly accompanied by Jim Coupe. Finally, closing the formalities of the occasion, guest tyler Bob Bennett provided a passionate and cheery toast at the end of the evening. Photographs courtesy of Glenn O’Brien. Pictured from left to right, are; Jim Finnegan, John Rimmer, Geoffrey Pritchard, Keith Beardmore, Martyn Jones, Sheldon Rawstrone, Norman Cope, John Turpin and John Guest.